There is a Task and a number of subtasks under it. I need to synchronize the parent and child issue statuses, i.e. if all subtasks are on "In progress", parent issue should be transitioned to <Development> status, if on "Closed", then parent should be transitioned to <Testing>. I tried to find the right condition for this, but this one doesnt work and I have no idea about it. Could you please help with it? Parent issue is not in a status where transition "Send to development" is available. Maybe you are selecting a transition with the same name that belongs to a different workflow. There is a condition or a validator in transition "Send to development" which is not being satisfied, and thus is blocking its execution. Check "Skip Conditions" and "Skip Validations". 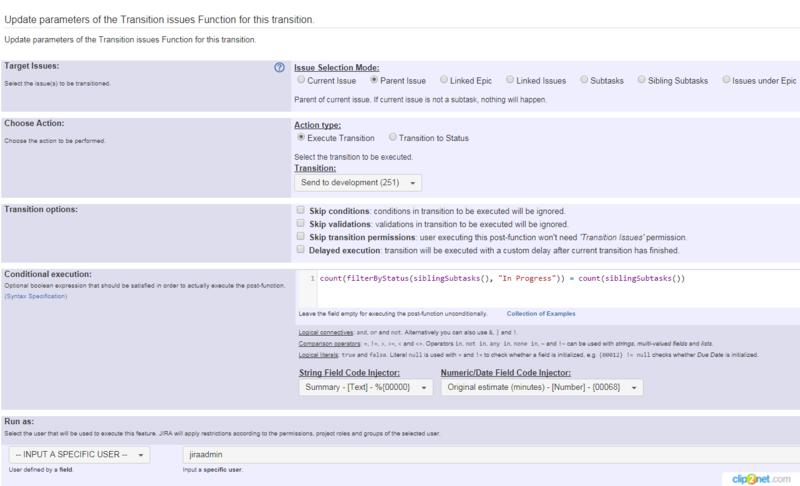 Select "Transition to Status" in parameter "Choose Action", and select status "Development". If none of this changes solves your problem, we can have a screen-share through Skype. My Skype user is fidel100r. Skipping Conditions and Validations helped.